that assist buyers and sellers of privately held small and mid business in the buying and selling process. We typically estimate the value of the business; advertise it for sale with or without disclosing its identity; handle the initial potential buyer interviews, discussions, and negotiations with prospective buyers; facilitate the progress of the due diligence investigation and generally assist with the business sale. PRICING: We analyze your business and suggest a realistic price & terms. To determine the right value of your business we have to perform a Business Valuation, which is a process and a set of procedures used to estimate the economic value of an owner's interest in a business. Three different approaches are commonly used in business valuation: Income Approach, Market Approach aNew Linknd Asset-Based Approach. Business Valuation is a critical process because if you price your business too high, you'll scare away buyers but If you price it too low, you'll risk selling at a bargain basement discount. Your goal is to figure out a range that's realistic. ADVERTISING: We advertise your business to get the highest possible response and the greatest numbers of prospects worldwide. We use specialized Web sites such as Mergernetwork, Bizbuysell, IBBA, Businessforsale among others. Additionally we contact Private Equity Groups, Investing Firms, and Investing Banks worldwide that specialize in the industry to look also for potential buyers. 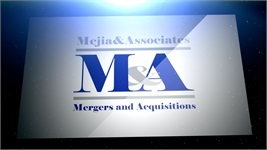 Mejia & Associates Inc will help keep information from leaking out prematurely. SCREENING: Interview of buyers to eliminate those who are unable or not ready to purchase you business at this time. INTRODUCTION : Presentation of the business to qualified potential purchasers. We discuss the various components and benefits of the business with the potential buyer. MEETING : A possible meeting with you, the potential purchaser and our team is set up, to prove the buyer's interest and give an opportunity to learn more about the buyer. Transportation and expenses paid by seller. ASSIST WITH FINANCING: We have several financial resources to help the buyer to get the financial resources in case are needed and work with several Private Equity Groups. OFFER TO PURCHASE: We encourage buyers to write a fair offer accompanied with an earnest money deposit check. PRESENT OFFER: We will present the offer for purchase to you. At the time, we can provide with background information on the buyer and explain the buyers reasoning behind the offer. ACCEPT THE OFFER: You may accept the offer as presented or you may use our knowledge and experience to structure a counter offer. EXPLANATION: Explain the terms and conditions of the offer to you. MUTUAL ACCEPTANCE: At this critical point we use our negotiation skills and expertise to create a mutually acceptable agreement that becomes a contingent purchase and sale agreement. INSPECTION AND DUE DILIGENCE: Nearly all offers are contingent upon the buyer's inspection and approval of all aspects of the business operation including financial records. The handling of due diligence is the most important step in the process of a successful sale. You will need to satisfy the buyer that you have all the necessary licenses and permits necessary to operate the business. CONTINGENCY REMOVAL. : The buyer's needs to remove all the contingencies for the agreement to become a binding offer for purchase and sale. CLOSING PREPARATION: The closing documents are based on hundreds of prior transactions. They are tailored to meet the individual needs of you and your buyer at the time of the sale. They are coordinated by either an attorney or an escrow company. INVENTORY: When applicable, we have professionals that will assist you with the inventory process. A SUCCESSFUL SALE : We assist with the many details required for a smooth transfer of possession. All parties then sign the final agreement, the business is transferred and funds are distributed.